Israeli colonizers attacked, Thursday, several Palestinian cars driving near the junction of Burqa village and Sielet ath-Thaher town, south of the northern West Bank city of Jenin, causing damage and wounding one woman. Eyewitnesses said dozens of illegal colonizers closed the main road near the junction, and burnt many tires, before hurling stones at dozens of cars, causing damage, and wounding the woman. Resident Mohammad Abu al-Haija said that he was driving in the area, near the evacuated illegal colony of Homish, while was heading to Jenin city with his family, before the colonist started throwing stones at his car. The wounded Palestinian woman was rushed to Khalil Suleiman Governmental hospital in Jenin. In related news, the soldiers installed a military roadblocks on the Jenin-Nablus Road, south of Jenin, before stopping and searching dozens of cars, and interrogated many Palestinians while inspecting their ID cards. 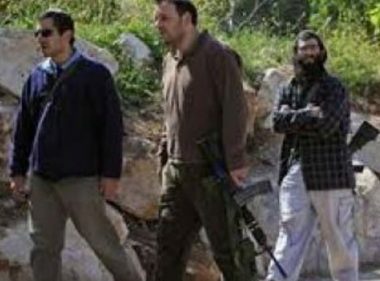 On Thursday at noon, a group of extremist illegal Israeli colonizers invaded Palestinian orchards near the junction between Burqa and Sielet ath-Thaher town, south of the northern West Bank city of Jenin, injured one woman and burnt at least 30 olive trees.